Be Superman underwater. Be a dolphin, be a submarine. Ride on the surface, dive underneath. Experience something new that combines a little bit of waterskiing, a lot of free diving, and, of course, underwater swimming. Glide close to underwater reefs, race a dolphin, amaze the fish with your acrobatic skills. That’s what dive boarding is all about. There are two kinds of diving boards that provide a similar experience: Subwing and Nautboard. Let’s look at them both to see which one will make your summer water adventures even more exciting. The Nautboard was created by AquaNaut International, an Israeli company staffed by people who love to boat, swim, surf, and spend time in the water. Someone had the bright idea to take waterskiing under the surface of the waves, and the result was the Nautboard. Lay on the surface and hold the board; it floats. Let a friend tow you behind a boat or jet ski and enjoy the ride. Then take a deep breath, tip the Nautboard down, and you’ll submerge. Glide along with the fish, view a coral reef up close, and feel like you’re flying through the water. When it’s time to take a breath, tip the board up and you’ll surface. See the Nautboard in action in this video. This could be you in the water. Tell your friends to being their cameras to catch you in the act of having a blast dive-boarding. 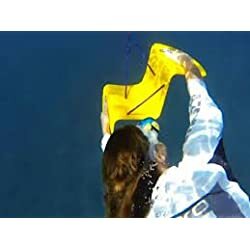 The Nautboard is made from polypropylene plastic that is lightweight, durable, and flexible. It’s resistant to sunlight and comes in various colors. AquaNaut offers a 5-year warranty. Subwing was invented by a Norwegian who had a bright idea while diving in Greece. He hacked together the first ever homemade Subwing from cutting boards and garden hose connectors. Over time, the Subwing design evolved to the sleek design it has today. The Hexagon is also simple to maneuver and spin while underwater. Let the boat pull you along on the surface, then angle the board downward to dive. Twist the wings to spin, tilt them to move up and down like a dolphin. When you’re ready to surface, angle the board upward. The Subwing is made of ABS polymer (plastic) so it will stand up to hard use. Inside its outer shell it has a honeycomb design to make it light and strong. Because of the hollows in the honeycomb design, the Subwing floats. If you ever need to replace the ropes or connectors, you won’t need any tools to do it. The Subwing comes apart in the middle for transport or storage. This dive board is so light a small boat or jet ski can tow you. The suggested speed is 2 to 4 knots, which doesn’t sound like much, but it feels fast under the water. For that reason, you’ll want a dive mask or goggles. Use a 50-foot tow rope and either a surface buoy or a “Diver Down” flag so that other boats stay clear. See what the pros thought of the Subwing in this video review. The Subwing Hammershark has a different surface design than the Hexagon, but is the same in every other way. It comes ready to go as soon as you add water, a tow rope, and a vehicle to pull you. You can even practice in a pool first if you have someone to pull your rope. The Hammershark is made of the same durable, lightweight ABS polymer as the Hexagon. It has wings that move independently or together so you can dive and do twists and turns. Subwing suggests practicing a bit before trying to control the Hammershark with just the rear rubber triangle grip. Check out how to ride a Subwing in this video. Get a nice, strong, brightly colored tow rope that you can use for more than just dive-boarding. Speedo is a top name in water sports. This mask has a soft silicone skirt so it seals nicely and feels comfortable. The polycarbonate lenses are coated to resist fogging. Protect your camera underwater for the ultimate dive board selfies. You can have a hot shower and change your clothes without going home first. See these portable pressurized showers that make it fast to clean up after a fun day on the water. If you’re camping, catch some Zs on the most comfortable air mattresses on the market.